MERLIN & ARCHIMEDES PRODUCTION CELS WALT DISNEY STUDIOS GOUACHE ON CEL, 1963. Original hand painted production animation cels of Merlin, Archimedes and Owl Wing Flutter Effects from "The Sword In The Stone, " 1963, Walt Disney Studios; Set on a lithographic background; Unframed. This is Archimedes, a highly educated owl. "The Sword in the Stone, " 1963 is the 18th full length feature film produced by Walt Disney and it was released on December 25, 1963 by Buena Vista Distribution. The film was based on the novel of the same name, that was first published in 1938. It was later republished in 1958 as the first book of T. White's tetralogy The Once and Future King. It was to be the final Disney animated film released before Walt Disney's death on December 15, 1966. The songs in the film were written and composed by the Sherman Brothers, who would become very famous for their future work on later Disney films including; "Mary Poppins, " 1964, "The Jungle Book, " 1967, and "Bedknobs and Broomsticks, " 1971. Merlin is a very powerful wizard with a pet owl named Archimedes. He befriends and becomes the teacher of a 12-year old orphan named Arthur, who goes by the name of Wart. Merlin is first seen living in a forest cottage, and he believes in the philosophy of Brain over Brawn. As a wizard, he is very intelligent, has a wide variety of powers, and is considered the most powerful wizard in the world. He has the ability to see into the future, and has the ability to shape-shift. Merlin was animated by Milt Kahl, Frank Thomas, and Ollie Johnston; and voiced by Karl Swenson who was an American theater, radio, film, and television actor. Archimedes (named after the Greek mathematician, physicist, philosopher, engineer, inventor, and astronomer) is Merlin's pet talking owl, who is very well educated and also versed on practical knowledge. He can be a bit sarcastic and somewhat grouchy, and he is not afraid to point out Merlin's shortcomings. 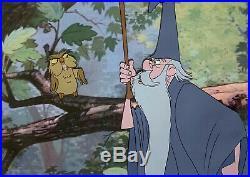 He was based on Merlin's talking owl from "The Sword in the Stone" by T.
S Size - Merlin & Archimedes: 7 1/4 x 10", Image 7 1/4 x 10". 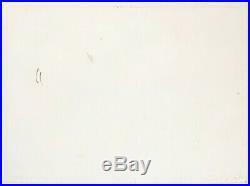 Condition: See pictures of the actual cels, which are in excellent overall condition as shown by the pictures above! All items we sell are from a smoke-free/mold-free home/workplace and are in excellent condition unless otherwise noted. 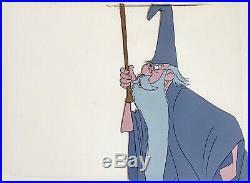 The item "1963 DISNEY SWORD IN THE STONE MERLIN ARCHIMEDES OWL ORIGINAL PRODUCTION CEL" is in sale since Wednesday, March 27, 2019. 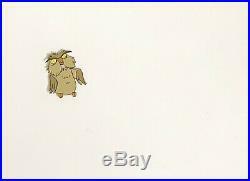 This item is in the category "Collectibles\Animation Art & Characters\Animation Art\Production Art". The seller is "shadowline" and is located in Durham, North Carolina. This item can be shipped worldwide.